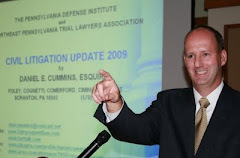 DANIEL E. CUMMINS, ESQUIRE is an AV-rated insurance defense attorney with the Scranton, Pennsylvania law firm of FOLEY, COMERFORD & CUMMINS. In addition to being a civil litigator, he also writes a regular column for the Pennsylvania Law Weekly on important cases and emerging trends under Pennsylvania law. He is also the former author of the annual Supplement for The Pennsylvania Trial Advocacy Handbook. One of those emerging issues in Pennsylvania civil litigation has to do with whether Pennsylvania products liability cases should be analyzed under a Restatement (Second) analysis or a Restatement (Third) analysis. Here's an updated list of the conflicting Pennsylvania State Supreme Court and Federal cases uncovered to date on the issue. 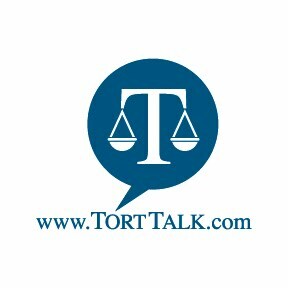 I have created a link on the right hand column of Tort Talk (http://www.torttalk.com/) entitled "Products Liability Restatement Scorecard" that will be continually updated. The Scorecard will remain up on the blog for you to click whenever you need this information. Just click on the date below "Products Liability Restatement Scorecard" to access the Scorecard at any time. It is emphasized that the below list cases may not be exhaustive and there may be other decisions out there that I am not aware of at present. As such, it is recommended that you conduct your own additional research on the issue. As it is important that new decisions on this topic be publicized so that a consistent common law in this novel area can be developed. I would appreciate it if you could please advise me of any new cases that you may come across on this topic so that those decisions can be highlighted here. Section 402A of the Restatement (Second) of Torts, which first came back into play in 1965, provides, in pertinent part, that “[o]ne who sells any product in a defective condition unreasonably dangerous to the user or consumer” may be held strictly liable to the injured party even if the “seller has exercised all possible care in the preparation and sale of this product." Generally speaking, under the Restatement (Second) of Torts analysis, manufacturer defendants are held to be strictly liable for any manufacturing defects in their products. With regards to design defect claims, since approximately 1984, the Pennsylvania courts have used a risk-utility analysis to initially determine, as a matter of law, whether a product may be considered by the jury to be defective. Daumbacher v. Mallis, 485 A.2d 423, n. 6 (Pa.Super. 1984) and Surace v. Caterpillar, Inc. 111 F.2d 1039 (3d Cir. 1997). If the case makes it beyond this threshold finding, the matter will be permitted to proceed to the jury for a determination as to whether a product’s design was defective and the cause of the injury alleged. Id. Under Section 2 of the Restatement (Third) of Torts, recognized product defects that may subject a defendant to liability include (1) manufacturing defects, (2) design defects, and (3) failure to warn defects. In Section 2 of the Restatement (Third) of Torts, the definition of a manufacturing defect is essentially identical to that contained in the Restatement (Second), i.e., strict liability is owed to the injured party for any injuries caused by a manufacturing defect of the product. However, in contrast to the principles espoused under the Restatement (Second) of Torts, claims asserting a design defect or a failure to warn are to be analyzed with reference to certain negligence principles and concepts delineated under the Restatement (Third) of Torts. For example, the Restatement (Third) of Torts: Products Liability, § 2(b) states, in pertinent part, that a product is defective in design when the foreseeable risks of harm posed by the product could have been reduced or avoided by the adoption of a reasonable alternative design by the seller or other distributor, or a predecessor in the commercial chain of distribution, and that the omission of the alternative design renders the product not reasonably safe. Stated otherwise, while the analysis of design defect cases under the Restatement (Second) of Torts focuses on the actual design of the product, the basis for liability under the Restatement (Third) of Torts in this context includes a consideration of the reasonableness of the defendant’s conduct. Essentially, while Restatement (Second) standard focuses on an intended user making an intended use of the product, the Restatement (Third) places the emphasis of the analysis on the foreseeable risks of harm and whether an alternative design could have minimized or eliminated that risk. Another difference with the Restatement (Third) of Torts in the products liability context is that, under Restatement (Third) analysis, the plaintiff’s own acts or omissions, i.e., contributory negligence, are made an important part of the analysis of whether or not a product should be determined to be defectively designed. Webb v. Zern, 220 A.2d 853 (Pa.1966)(Pennsylvania Supreme Court adopts Restatement (Second) of Torts as the appropriate standard for Pennsylvania Products Liability cases). Phillips v. Cricket Lighters, 841 A.2d 1000, 1012, 1019 (Pa. 2003)(In his concurring Opinion, Justice Saylor suggests the need to consider the Restatement (Third) in products cases). Bugosh v. I.U. North America, Inc., 942 A.2d 897 (Pa. 2008) appeal dismissed as improvidently granted 971 A.2d 1228, 1229 (Pa. 2009)(Pennsylvania Supreme Court agrees to decide the Restatement (Second) versus (Third) debate but then dismisses the appeal as improvidently granted.). Schmidt v. Boardman Co., 11 A.3d 924 (Pa. 2011)(Pennsylvania Supreme Court acknowledged that “foundational problems” existed in Pennsylvania products liability law based upon the Restatement (Second) of Torts. However, the court noted that the case before it was not selected to address those “foundational concerns.” References Third Circuit's prediction in Berrier but does not decide issue.). Beard v. Johnson & Johnson, 41 A.3d 823 (Pa. 2012) (Most recent on-point pronouncement by Pennsylvania Supreme Court on the Restatement (Second) versus (Third) debate in which the court reiterated, as it has since 1966, that the standards set forth in § 402A of the Restatement (Second) of Torts are to be applied in Pennsylvania products liability cases.). Reott v. Asia Trend, Inc., 55 A.3d 1088 (Pa. 2012)(A shorthanded Pennsylvania Supreme Court issued a 5-1 decision recognizing that "highly reckless" conduct is an affirmative defense in products liability cases under which defendants could attempt to avoid liability by showing that a plaintiff's highly reckless conduct was the sole or superseding cause of the plaintiff's injuries. In so ruling, the majority, in an opinion written by Justice Max Baer, relied, in part, upon Section 402A of the Restatement (Second) of Torts, evidencing continuing viability of that standard). Lance v. Wyeth, ___ A.3d ___ (Pa. Jan. 21, 2014)(Split court addresses products liability issues and the result of this case calls into question whether the Pennsylvania Supreme Court would fully adopt the Restatement (Third) if squarely faced with the issue.). Berrier v. Simplicity Manufacturing, Inc., 563 F.3d 38 (3d Cir. 2009)(Third Circuit, seeing that the Pennsylvania Supreme Court has agreed to decide the issue in the case of Bugosh v. I.U. North America, Inc. predicts that the Pennsylvania Supreme Court will adopt the Restatement (Third) analysis. Pennsylvania Supreme Court thereafter dismissed the appeal in Bugosh as improvidently granted and, even later in 2012, reaffirms the Restatement (Second) in Beard v. Johnson & Johnson.). Covell v. Bell Sports, Inc., 651 F.3d 357, 365 (3d Cir. 2011)(In this decision, which is after the dismissal of the appeal by the Pennsylvania Supreme Court in Bugosh and before the Pennsylvania Supreme Court's reaffirmation of the Restatement (Second) as the proper standard in Beard v. Johnson & Johnson, the Third Circuit Court of Appeals again predicts that the Pennsylvania Supreme Court would adopt the Restatement (Third). As noted, the Supreme Court declined to do so in its subsequent decision in Beard.). Sikkelee v. Precision Automotive, 2012 U.S. App. LEXIS 22185, n. 1 (3d Cir. 2012)(In a footnote in a decision clarifying its denial of an appeal, the Third Circuit again suggests that the Restatement (Third) is the proper standard for Pennsylvania products liability cases despite Pennsylvania Supreme Court decisions stating otherwise.). But see: Thompson v. Med-Mizer, Inc., 10-CV-2058, 2011 WL 1085621 (E.D. Pa. 2012 Perkin, M.J.)(Magistrate Judge Perkin took case over and ruled in favor of applying Restatement (Third) in light of Third Circuit's more recent Order issued in Sikkelee case). Carpenter v. Shu-Bee's, Inc., CIV.A. 10-0734, 2012 WL 2740896 (E.D. Pa. 2012 Perkin, M.J.)(Magistrate Judge Perkin follows Restatement (Second)). Reardon v. Illinois Tool Works, Inc., PICS Case No. 13-0891 (E.D Pa. April 10, 2013 Yohn, J. ), (Judge Yohn of the Eastern District Federal Court chose to apply the Restatement (Third) of Torts in deciding a Defendant’s Motion to Exclude Expert Testimony and For Summary Judgment. Ultimately, with the application of the Restatement (Third) to the facts of this case, the court denied the Defendant’s motion.). Kordek v. Becton, Dickinson & Co., 2013 WL 420332 (E.D. 2013)(Judge Mary A. McLaughlin applies Restatement (Third) of Torts as supported by Third Circuit Court of Appeals' decisions predicting that Pennsylvania Supreme Court will adopt Restatement (Third)). Hoffman v. Paper Converting Mach. Co., 694 F. Supp. 2d 359, 364-65 (E.D. Pa. 2010 Tucker, J.) (Judge Petrese B. Tucker of the Eastern District Federal Court of Pennsylvania, noting that, as of that time, the Pennsylvania Supreme Court had dismissed the appeal in Bugosh without deciding the issue, opted to follow the Third Circuit Court of Appeals reference to the Restatement (Third) in Berrier as “binding precedent.” In so ruling, Judge Tucker cited Richetta v. Stanley, 661 F.Supp.2d 500 (E.D. Pa. 2009 Golden, J. ), and Martinez v. Skirmish, U.S.A., Inc., 2009 WL 1437624 (E.D. Pa. 2009 Padova, J.) with approval.). Xia Zhao v. Skinner Engine Co., 2:11-CV-07514-WY, 2012 WL 5451817 (E.D. Pa. 2012 Yohn, J. )(Judge Yohn chooses to follow Third Circuit prediction on Restatement (Third).). Gilmore v. Ford Motor Co., No. 2-12-CV-00547 (W.D.Pa. 2013 Schwab, J. )(Judge Arthur J. Schwab applies Restatement (Second) of Torts). Gross v. Stryker, 858 F.Supp.2d 466 (W.D.Pa. 2012 Fischer, J. )(Judge Nora Barry Fischer elects to follow Restatement (Second).). Konold v. Superior International Industries, 2012 U.S. Dist. LEXIS 156200 (W.D.Pa. 2012 Schwab, J. )(Judge Arthur J. Schwab applies Restatement (Second) of Torts). Schif v. Hurwitz, 2012 WL 1828035 (W.D.Pa. 2012 Schwab, J. )(Judge Arthur J. Schwab applies Restatement (Second) of Torts). Sansom v. Crown Equipment, 2012 U.S. Dist. LEXIS 103734 (W.D.Pa. 2012 Hornak, J. )(Judge Mark R. Hornak applies Restatement (Third) under Third Circuit's predictions). Lynn v. Yamaha Golf-Car, 2012 U.S. Dist. LEXIS 115936 (W.D.Pa. 2012 Hornak, J. )(Judge Mark R. Hornak applies Restatement (Third) under Third Circuit's predictions). Zollars v. Troy-Built, 2012 U.S. Dist. LEXIS 148614 (W.D.Pa. 2012 Ambrose, J.). )(Judge Donetta W. Ambrose applies Restatement (Third) under Third Circuit's predictions). Spowal v. ITW Food Equipment Group, 2012 U.S. Dist. LEXIS 47614 (W.D.Pa. 2012 Cohill, J.).. )(Judge Maurice Cohill applies Restatement (Third) under Third Circuit's predictions). Sikkelee v. Precision Automotive, 876 F.Supp.2d 479 (M.D.Pa. 2012)(Judge Johne E. Jones, III chose to instead follow the Restatement (Second) in products liability cases contrary to the Third Circuit's predictions. Judge Jones respectfully noted that federal district courts are not required to follow predictions by the Third Circuit where that prediction does not appear to have been realized in state court precedent. Leave to appeal denied 2012 WL 4953074 (3d Cir. 2012), Rehearing and Rehearing in Banc denied 2012 WL 5077571 (3d Cir. 2012)(Third Circuit issues short opinion in which it invokes doctrine of stare decisis and again stands by its prediction that Restatement (Third) will be adopted). Varner v. MHS, Ltd.,No. 3:11-2138 (M.D. Pa. March 6, 2014, Mannion, J. )(Judge Malachy Mannion applied the Restatement (Third) in a products liability action arising from an incident during which the Plaintiff was injured at work while using a nylon strap or sling to lift heavy equipment. Defendant's motion for summary judgment granted in part and denied in part). Lynch v. Gander Mountain Co., 2013 U.S. Dist. Lexis 121322 (M.D. Pa. Aug. 27, 2013 Caputo, J. ), (Judge Caputo found that because the Third Restatement of Torts should be applied, the defendant's motion to dismiss a count in plaintiff’s Complaint asserting strict liability under Restatement Second §402A was granted. However, the court separately found that the Plaintiff had sufficiently stated a claim for breach of warranty of merchantability and breach of warranty of fitness for a particular purpose. As such, the defendant's motion to dismiss those counts were denied.). 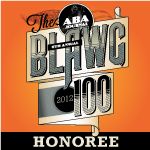 Vaskas v. Kenworth, 3:10 CV-1024, 2013 WL 101612 (M.D. Pa. 2013 Caputo, J. )(Judge A. Richard Caputo follows precedent of Third Circuit prediction in favor of Restatement (Third). )(In an Opinion, on Motion for Reconsideration, Judge Caputo reiterated his prior ruling under the Third Restatement and applied it to enter summary judgment on the negligence claims as well.). Giehl v. Terex Utilities, CIV.A. 3:12-0083, 2012 WL 1183719 (M.D. Pa. 2012 Caputo, J. )(Judge A. Richard Caputo follows precedent of Third Circuit prediction in favor of Restatement (Third). ).